Sir Norman Reid, former Director of the Tate Gallery and a close friend of Naum Gabo (1890–1977), gave a powerful account of his last visit to the artist’s home in Connecticut in 1976. To his amazement, Gabo and his wife brought out quantities of drawings, sketchbooks and models that had been carefully put aside throughout his career. ‘They were not all in perfect condition,’ Reid recalled. ‘Some of the early plastic … had become desiccated and a few of the models had suffered somewhat. Nevertheless, it was a gathering to make the eyes sparkle.’ The material that the Tate Archive will catalogue and publish includes some of the treasures which Reid saw and this project seeks to transform the study of Gabo’s work and life. Through the generosity of Gabo and his family, Tate holds the largest collection of his papers in the world. It comprises sixty-two boxes containing photographs, correspondence and other writings, and thirty portfolios of prints, drawings, templates and models. In total, we estimate that over 50,000 items make up this archive. Tate also holds the largest collection of the artist’s artworks (132 in all). The main archive, TGA 9313, is an extraordinarily rich archive consisting primarily of material relating to Gabo’s life and work in England, from the time he settled in Hampstead in 1936 until he moved to the United States in 1946. A critical moment in his career and in the history of modernism in this country, it was also one of his most productive and inventive periods. Notwithstanding this focus, the deposit also includes photographs and other records covering the artist’s entire working life. Family correspondence: including early runs of important letters to and from his family, notably his artist brothers, Aleksei and Antoine Pevsner. Artist correspondence: including important series of correspondence with Ben Nicholson and with Norman and Jean Reid. Diaries: notably from the period of the Second World War, as well as later diary notes and entries from the 1960s and 1970s. Autobiographical writings: on which Gabo worked at various stages of his life – hugely important evidence when considered against documentation contemporaneous to the events described. Lectures and writings: some of which were not published during Gabo’s lifetime. There are also ‘scratchpads’, documenting less formal thoughts and ideas. Artwork: documenting many aspects of his working methods and practice. These include five sketchbooks, one oil painting, and approximately 250 drawings, mostly unframed; patterns, shapes, templates and drawings relating to various works; and designs for interiors and an unrealised Jowett car. Press-cuttings: both in volumes and loose, from 1922 onwards. Printed ephemera: articles and posters; rare exhibition catalogues, books and other published material. Photographs: historic photographs, negatives and prints of sculptures and drawings documenting many aspects of his working methods and practice; photographs of Gabo, his work, family, installation shots of exhibitions from 1948 onwards; glass negatives, 35 mm slides, etc. The second collection, TGA 9314, was acquired at the same time and constitutes a separate printmaking archive. This archive was assembled in order to give a complete overview of Gabo’s printmaking and to be reunited with the sixteen engraved wood blocks (TGA 798), donated by Miriam Gabo, the artist’s wife, and the extensive and fine collection of wood engravings donated by Gabo to the Tate Gallery in 1967 and 1971, and by Nina and Miriam Gabo in 1979. The project will take place over a period of two years and will make detailed descriptions of all the collections available searchable on the web. Selected photographs, drawings, letters and visual material will be chosen for digitisation, and will add to the growing resource on Gabo available at Tate Online. Links from the artist’s works page will be launched within the Collection section of the Tate website and also from the Research section, where the Archive catalogue is available. These will take the reader to a textual introduction to the project, images and links to related Gabo content in the Learning, Online Events and Magazine sections of the website. Tate’s Digital Programmes department will give this content ‘special imaging treatment’, which will take it beyond a two-dimensional representation of an object. 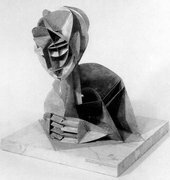 Tate’s Interpretation and Education department will create a resource pack for schools, using the Gabo Archive as a point of discovery for learning about sculpture. It will devise a series of workshops and an in-service training programme for teachers. 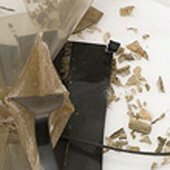 Conservators in Tate’s Sculpture Conservation department are analysing, using laser technology, the sculptures in Tate’s collection made in early plastic by Gabo, which because of the unpredicted but inherent instability of the material are subject to irreversible warping and disintegration. The Gabo archive is an essential resource for this project, revealing documentary and material evidence about the artist’s intentions and working methods. Manuscripts, historic photographs and negatives of works promise to throw light on Gabo’s working practices, while the Archive’s holdings of plastic pieces, patterns, templates and models relating to sculptures are crucial to questions surrounding replication. As the cataloguing project progresses, findings will be shared with the key members of the team. We expect the results of the cataloguing of the archive to feed into the international public conference on sculpture replication planned for 2010. Owing to Gabo’s migration, his artistic development and influence cover the art worlds of several key locations, and with this in mind, his family donated groups of papers to institutions in three locations: the Tate Archive in London, the Beinecke Rare Books and Manuscripts Library at Yale University, USA, and the Berlinische Galerie in Berlin, Germany. These deposits broadly reflect the time Gabo spent in each country, with Tate holding the middle period relating to Gabo’s life after he left Germany in 1932 and particularly to his years, 1935–46, in England. Beyond the broad geographical and chronological association with the three locations, however, boundaries between the three groups of papers are not clearly defined and there are areas of overlap. We aim to facilitate resource discovery by making explicit the relationships between the three collections of papers. We shall work with colleagues at the Beinecke and the Berlinische to ensure that there is clear linking between websites and that explanations are provided so that researchers can identify and locate the material they need across the three institutions. A cordial invitation has been offered by both institutions to Tate’s Gabo cataloguer to visit their Gabo archives. In the second year of the project we shall invite staff from the Beinecke and the Berlinische to meet together with us at Tate, so that we can develop and strengthen the partnership. We shall explore with them the issues surrounding dispersal of an archive collection over several countries, so often the result of the émigré experience in the twentieth century. We hope to host a research seminar at Tate on this subject, attracting a wide range of historical scholars to coincide with the visits from Yale and Berlin. The project is supported by the Getty Foundation, the philanthropic division of the J. Paul Getty Trust, Los Angeles. Anna McNally, ‘Gabo Cataloguing Project at the Tate Archive’, in Tate Papers, no.8, Autumn 2007, https://www.tate.org.uk/research/publications/tate-papers/08/gabo-cataloguing-project-at-the-tate-archive, accessed 24 April 2019.